I had a few good friends over for dinner. It so happen, one of my good friends love, no, she’s obsessed, with pineapples. 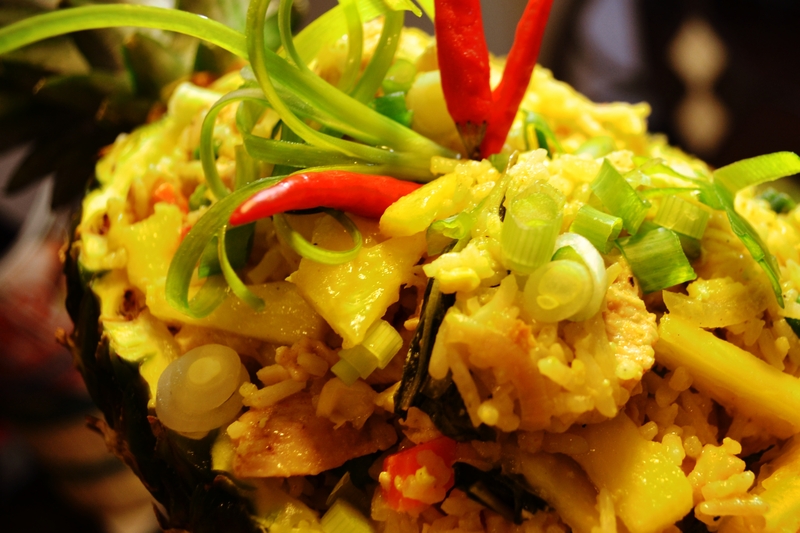 We have tried pineapple fried rice in many different restaurants, but she was always disappointed that it did not come in an actual pineapple, as most restaurant ads suggest. So, to surprise her, I carved out a pineapple to serve my fried rice in. She was impressed. 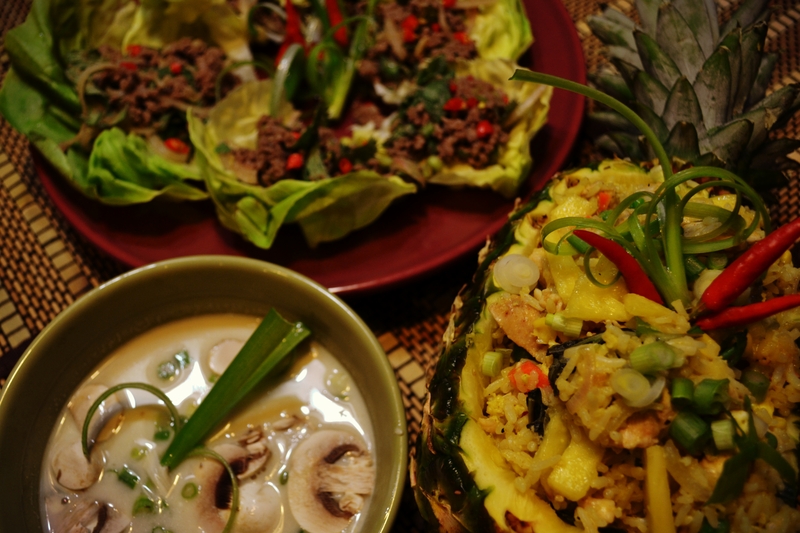 She even kept the pineapple “bowl.” For appetizer, I made beef larb and coconut chicken soup. Recipes for all three items are below. Enjoy! I have made this dish before using chicken. Here is the recipe once again, using ground beef. 1. 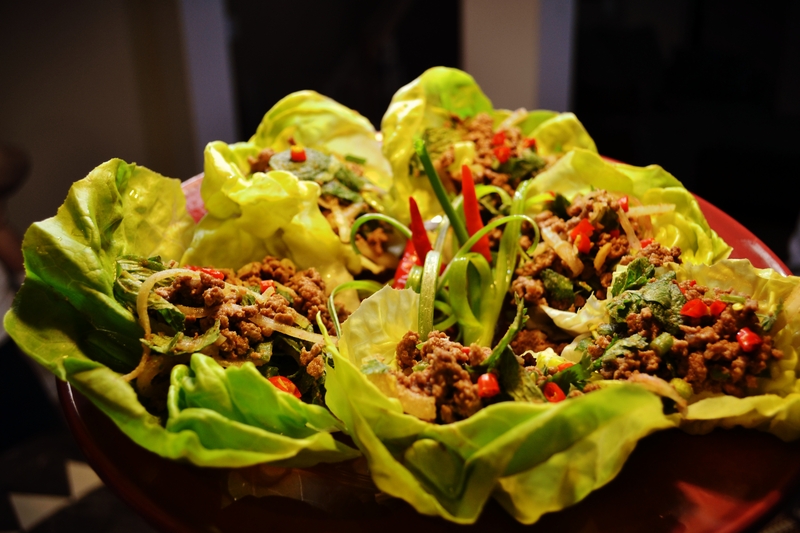 Take 2 tablespoons of lime juice and mix well with your ground meat. 2. Use a non-stick pan, saute your meat until fully cooked. 3. Once done, remove meat from pan and put in mixing bowl. 4. Add the rest of your ingredients to mixing bowl and mix well. 5. Taste and add more fish sauce or lime juice if needed. 6. Transfer to serving platter. Add your lettuce or cabbage to the side. I used romaine heart. The lettuce/cabbage will serve as your edible utensil. This is one of my favorite soups. It was my first time making it, and found it to be surprisingly easy. My friends asked for seconds, so I think they liked it too. 1. In a large stock pot, bring the chicken stock, lime leaves, chilies, garlic, ginger and lemongrass to a boil over medium heat. Then lower heat and let simmer for about 10 minutes. 2. Stir in coconut milk, fish sauce, sugar. 3. Gradually add your lime juice and adjust to taste. I made the mistake of adding way too much lime juice, then I had to go back and re-do everything. 4. Continue to simmer, add salt and pepper to taste. 5. When ready to serve, ladle your broth into a serving bowl, then add cooked shredded chicken and a few slices of mushrooms on top. Sprinkle with chopped green onion. 1. Generally for fried rice, it is best to use leftover rice, or just cook the rice the day before, cool, then leave in the fridge until ready to cook. Using a large mixing bowl, combine 1 tbsp of oil and rice. Mix and coat the rice with oil until the rice no longer stick together, then set aside. 2. Heat up your stir fry pan or wok under medium-high heat. Then add 2 tbsp oil, shallots, garlic, and chili and stir fry until the shallots get transparent. 3. Add the chicken and stir fry until they are no longer pink. 5. On the side, mix chicken stock, fish sauce, curry powder, and sugar until the sugar dissolves. Add to the eggs. 6. Add rice and the cooked chicken back into the wok. Mix until the rice are evenly coated with the eggs and sauce. Add a little more oil if rice starts sticking to the bottom of the wok. Although I like the “burnt rice” at the bottom of the pan the most, because of their crunch. 7. Add the basil and 2/3 of the spring onion, continue to mix. 8. When ready to serve, pour over to platter or hollowed pineapple. Garnish with the remaining green onions.